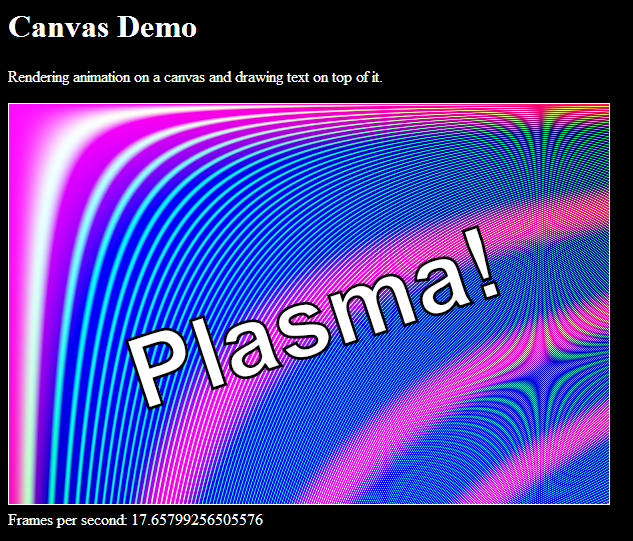 I have started playing around with HTML 5 canvas to see what it can be used for and decided to test the performance with an old animated plasma-like demo effect that I used to do in my early days of programming some 20 years ago (I can’t believe I’m that old, how did that happen?). This calculation has to be done for each of the (600 x 400 = 240 000) pixels in each frame. The limiting performance factor in this demo is definetely the CPU rather than the graphical performance of the canvas. 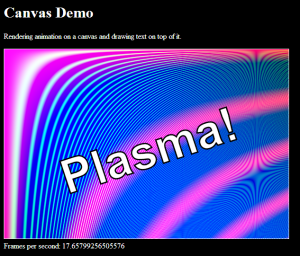 However, when I tried the demo in IE 9 on the same machine, I got about 5 fps! That’s 4 times slower! I have also tried the same demo with IE 10 and while that’s faster than IE 9, it’s still about 2.5 times slower than Chrome on the same machine. All is not bad for IE though since it rendered the rotating text better. Comparing IE and Chrome side by side it’s obvious that IE has more stable text rendering, in Chrome the individual characters jiggle slightly when rotating the text. Once you notice it, it’s actually rather ugly. PS. If you try the demo yourself, feel free to post your frame rates in a comment to this post, It’ll be interesting to see how much it differs. I now get 42 fps in Chrome on my laptop, i.e. more than doubled performance, which is rather nice. However, the result in IE 9 is still only 5 fps, the same as before. So now Chrome is 8 times faster! In Chrome on my Samsung Galaxy S3, the result is now 5 fps, also not a great improvement. The only deduction I can make from this is that for IE9 and Galaxy S3, it wasn’t the maths that limited the performance, but something else in the code. I don’t know what it might be so if anyone can shed some light on this it would really appreciated. The key is of course the RefreshTable function.